The War of the Rosens, set in 1965, is about an eccentric Jewish family in the Bronx in which the sibling rivalry between two young sisters—one of whom is seriously ill—reaches a danger point, forcing each family member to face the limitations and complexities of love and faith. “Eidus is a camouflage artist. Her sparkling novel has a dark underside, while beams of light struggle to break through the gray pall over this complex coming-of-age novel. 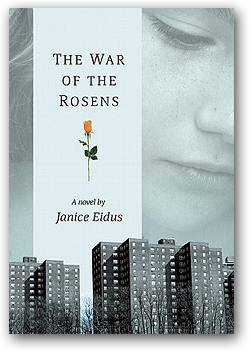 It’s 1965, and the unhappy Rosens live in the projects in the Bronx along with a diverse array of other Jewish families. Hot-tempered Leo, who runs a humble candy store, is a rabid atheist who tries to inoculate his two daughters against religion. His meek wife, a migraine-prone drudge with a predilection for Doom and Gloom tows the line, but May, 13 and burdened with a lazy eye, regularly beseeches God and longs for glamour and romance. Precocious 10-year-old Emma is a budding poet drawn to the Virgin Mary and deeply concerned about what it means to be a bad or good Jew. As the Rosens are cruelly tested, Eidus works out a calculus of guilt, fear, and love. Grim and incisive, caustically humorous, and affecting, Eidus’s drama of moral reckoning is rendered with barbed detail to yield what Leo calls ‘The Truth With a Capitol T.’"